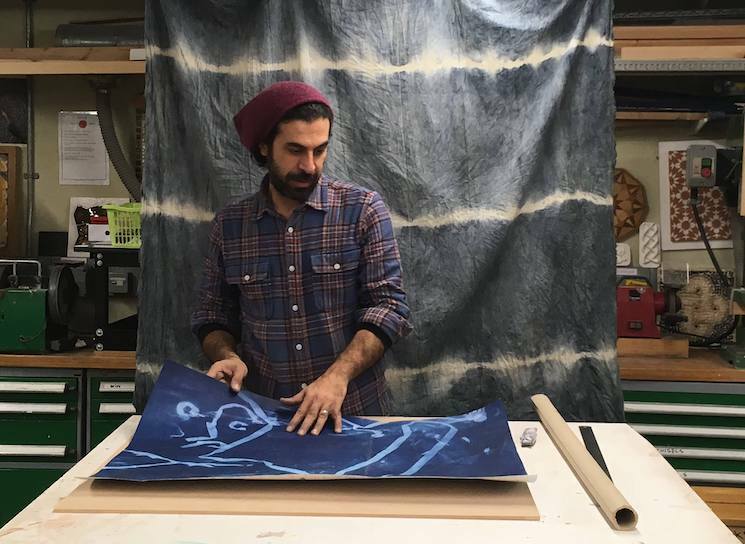 Shorsh Saleh, a Kurdish mixed-media artist, carpet designer and weaver, is taking up residency in the art studio in our Room to Breathe exhibition in April 2019. Having travelled to the UK as a refugee 17 years ago, Saleh deals with the subjects of migration, borders and identity through his work – with a particular focus on the Kurdish people, who have been stateless and subject to persecution for the past 100 years. “As someone who was born and raised in a war zone, art has always been a form of therapy, a magical tool to escape from suffering and trauma since I was a child. As a Kurdish artist my works relate to my experience as a stateless person, becoming a refugee and witnessing the deaths of hundreds of people. Art kept my soul alive during the process of leaving my homeland, the two years of travelling across borders illegally and the eight years of waiting for asylum in the UK,” Saleh explains. Saleh includes the traditional techniques of miniature painting in a contemporary context, using handmade natural pigments, dyes and papers. Saleh is also an experienced Persian carpet maker and many of his works are inspired by the symbolic motifs used in traditional carpets, combined with contemporary imagery. His current series of works are based on the subject of migrant journeys by sea and the imaginary notion of flying carpets being used to cross borders. Saleh studied MA Traditional Arts at The Prince’s School of Traditional Arts in London, where he has been teaching carpet weaving since 2015. He has also been teaching at the Museum of Islamic Art in Doha since 2017. Saleh has exhibited both nationally and internationally. His works are held in the Royal Collection Trust, the British Museum, the Bagri Foundation and The Islamic Art Museum, Malaysia. During Saleh’s open studio, participants will have access to geometric designs and biomorphic carpet motifs to copy and colour. These will be exhibited in his studio alongside his artwork throughout his residency, which runs from 4 April–28 April 2019. Find out more about Shorsh Saleh by visiting his website and following him on Instagram. Shorsh will be in his studio in our Room to Breathe exhibition between 3pm and 5pm every Saturday during his residency, when you can stop by to chat with him, and design your own flying carpet.